Launching an Event Entitled "World Occupational Therapy Day"
An awareness-raising program called "The International Day for Occupational Therapy" was held in cooperation with the Society of Disabled Children and Umm Al-Qura University in the premises of the College of Applied Medical Sciences, on 27 October 2018. The program is held annually in the presence of the female academic staff, employees and students. The Head of the Occupational Therapy Department, the specialist Samina Al-Qurashi, and the Department staff, Shabana Mabin and Fadwa Abu Emara, also attend the program. The program aimed to deepen public awareness of the importance of occupational therapy, and to promote the concept of different activities and its importance in the rehabilitation of those with special needs through some exercises specially prepared for children to make their lives easy and smooth, without the need of occupational therapy tools. An awareness-raising lecture titled, ("The Essence of Occupational Therapy and its Objectives", was delivered, which pleased the audience. Some awareness corners displaying the tools pertinent to occupational therapy were also established. An example of such tools included special chairs for children, splints, eating utensils such as spoons, forks and dishes, stationery such as pens and drawing tools with assistive handles, and other tools that the child should master. 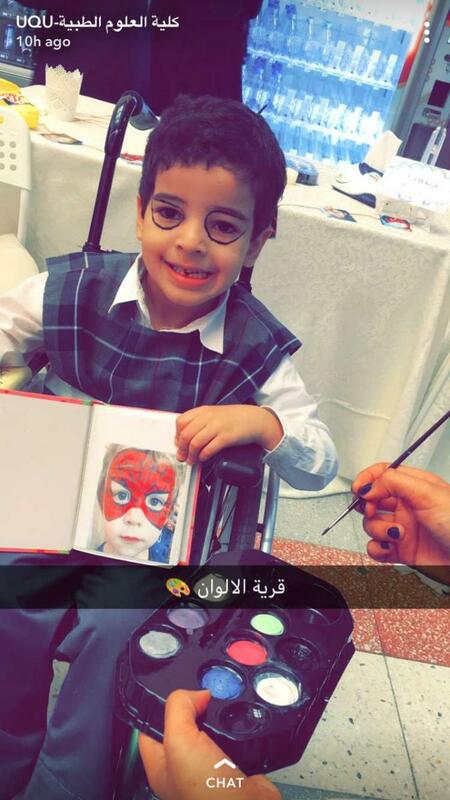 The female students of the Natural Therapy Department at the College of Applied Medical Sciences participated with an entertaining activity for the Society's children, who are nine children in all. The activity included playing with sand, drawing on the face, forming shapes, playing ball, and running. Sulaf Hijazi, the Head of the Society of Disabled Children in Makkah Al-Mukarramah, explained that occupational therapy is interested in focusing on defining environmental barriers and removing them to make the special needs child more independent and stronger. This aims to push him to participate in daily activities and focus on his priorities and interests so as to increase involvement, and also make the performance of the daily activities for the child easier, especially daily activities the child usually performs. The Occupational Therapy Department in the Society's Center in Makkah works in conjunction with the Educational Department, Natural Therapy Department, and the Speech and Language Unit in the Center. Moreover, there is cooperation among nurses and social and psychological workers to exert the best efforts for the sake of serving the children with special needs. The number of the children that have been enrolled in the Occupational Therapy Department in the Center since its establishment in 1999 up till the present is (985) male and female children. Links of some websites that conveyed the event include: Khabar News, Sanabil Al-Amal Magazine for the Disabled, Akhbar Al-Saudia 24, Bariq Electronic Magazine.